For $6,000, Will This 1971 Lincoln Continental Mark III Make Its Mark? How do you define classical elegance? 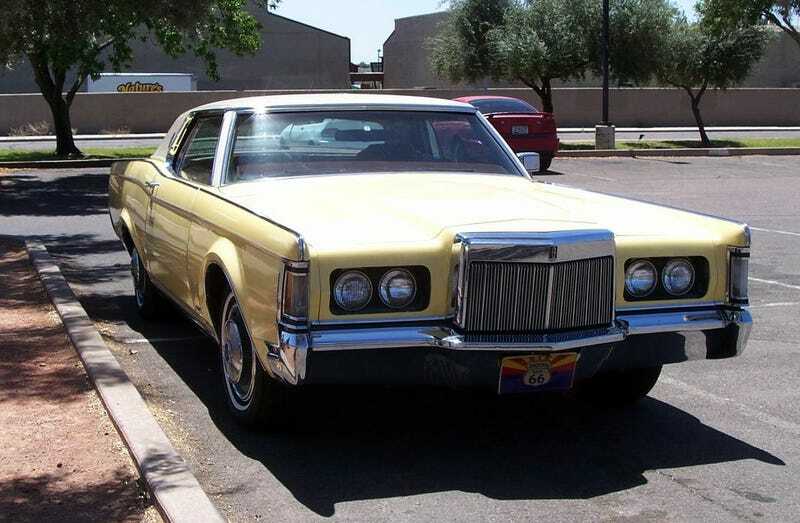 At one time Lincoln defined it with our Nice Price or Crack Pipe Continental Mark III. I tend to agree but we’ll still have to see if if even those that are baroque can buy this beauty. While I’m not surprised at the result, the 93% Crack Pipe loss racked up by yesterday’s odd custom 1977 Ford Bronco was still quite phenomenal. My point being that in the world in general you can’t get ninety-anything percent agreement on anything. Way to go team! Quick, what are you doing this weekend? Never mind, whatever it is it can’t possibly compare to getting your cruise on in a classic Lincoln Continental Mark III. You see, the Lincoln of today is nothing to get exited about. Sure, their cars are nice and all, but they’re really nothing more than fancy Fords. Back when the Mark III was introduced however, it was… a fancy Ford. Still, it was waaaaaay fancier. So here’s the deal, in the Sixties Lincoln wasn’t doing so hot. They were a perennial also-ran to Cadillac and a constant money loser for Ford. The Thunderbird wasn’t performing all that much better. Then FoMoCo chief, Lee Iacocca decided to leverage the investment in that slumping Thunderbird by building more cars on its platform and giving them to Lincoln. His specific direction was “put a Rolls Royce grille on a T-bird.” The result was the Continental Mark III and not only did it reuse an existing Ford platform, its nameplate was also a do-over as it was shared with a lamentable model offered in ’58-’59. We don’t talk about those, however. Instead, we’ll talk about this handsome 1971 Connie Mark III in buttercup with a white vinyl roof and cool matching tire stripes. The first thing you might notice about it is that the Mark III exudes a presence few cars of today possess. It may be little more (actually about 300 pounds more) than just a Thunderbird with a Rolls grille, but day-um that’s one good looking automobile. This one seems to be in excellent shape on the outside too, with no apparent degradation to the padded top, brightwork, or paint. All four wheel covers are present, and the passenger side remains unmarred by an obtrusive side-view mirror. Objects may be closer than they appear, but in this car, you’ll never care. It’s not all bosoms and ale however. The headlight doors seem to be open in all the pics so perhaps there is a vacuum leak to be addressed there. There’s also something fishy about the angle of the dangle of that Rolls Royce grille. I’m not sure if it’s been pushed in at the base or if it’s just a weird camera angle but it looks funny. There’s nothing funny about the faux spare tire hump on the boot lid however. Proper! Inside things are swathed in leather and sixties luxury/convenience. The ’71 had automatic climate control as standard and the controls are on the driver’s left keeping them out of reach of meddlesome passengers. Screw those guys! The seats show some wear, but that’s hard to notice in light of all the leopard print pieces dressing up the space. Those MUST be included in the sale or no deal will be made, says me. Mechanically this car seems to be a real find. There’s a claimed 34K on the clock and both the 460-CID V8 and C6 three-speed transmission are said to have been rebuilt. Heck, even the ancient A/C is claimed to work. The car comes with new tires, ancillaries, and brakes. There’s something especially of note about Mark III brakes as they were offered with an early form of anti-lock. Ford’s Sure-Track braking system worked only on the rears but managed lockup through a series of speed sensors and fluid pressure actuators all controlled by a glovebox-mounted computer. Fancy, I know! I don’t want to get all Eeyore on you here but the ad claims the sale of this Lincoln is forced by the need to pay for a funeral. I’m guessing that the car’s owner passed away and now it’s up to the car to put them in the ground. The price is $6,000, which when evaluated on a price per pound basis is a real steal. That’s also pretty cheap for something with such presence and luxury, but then it’s a lot for a car that may be just a fancy Ford. What’s your take on this Mark III and that $6,000 price? Does that seem to Mark all the right boxes? Or, is this a Continental breakfast that you’d skip? Tucson, AZ Craigslist, or go here if the ad disappears. For $20,000, Would This 1977 Ford Bronco Have You Going Long? For $5,700, Is This 1983 Lincoln Continental Mark VI Pretty Fly?